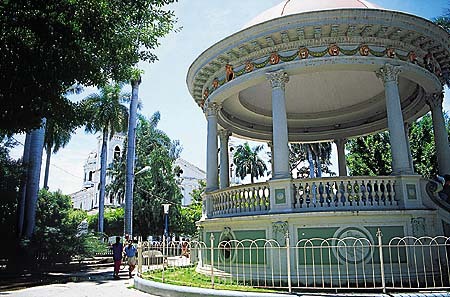 A few kilometers from Managua there is a very verdant area which makes a nice day trip. If you travel by car, don't take a lot of things in the trunk, because you'll need the space to haul all of the craftswork you will undoubtedly but by the roadside. 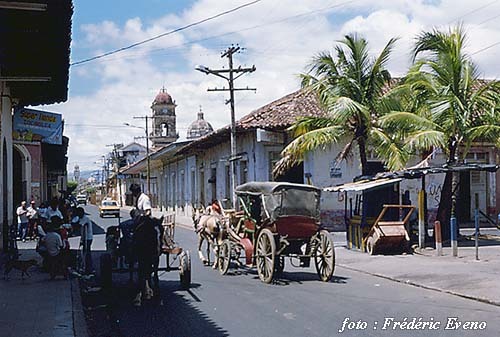 The route from Masaya to Granada ought to be called the "Route of the Artisans" because this region produces a good portion of the artisans of Nicaragua. 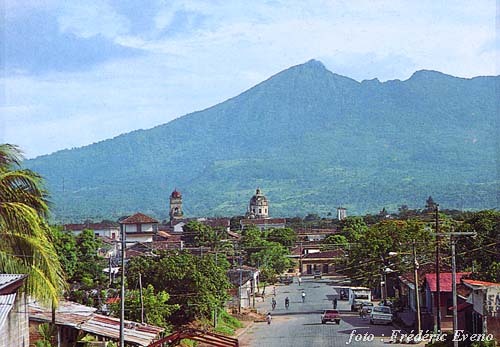 The city at the foot of Mombacho Volcano . 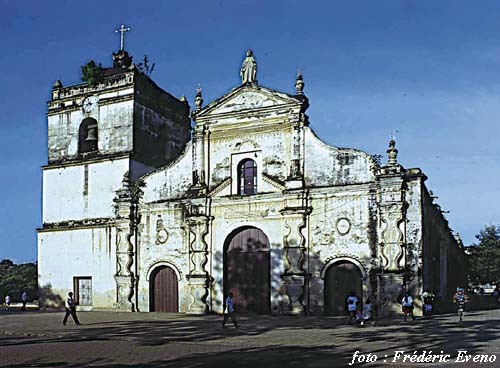 . .
Granada is situated on the shore of Lake Nicaragua. 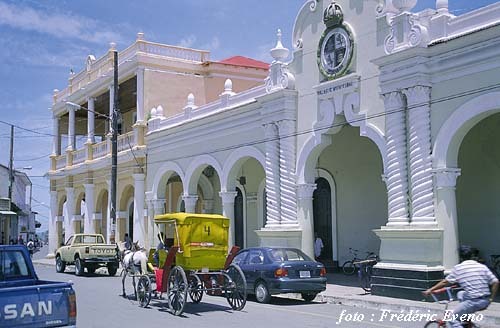 Like León, Granada was formerly the capital of Nicaragua. It is undoubtedly still the country's tourism capital. 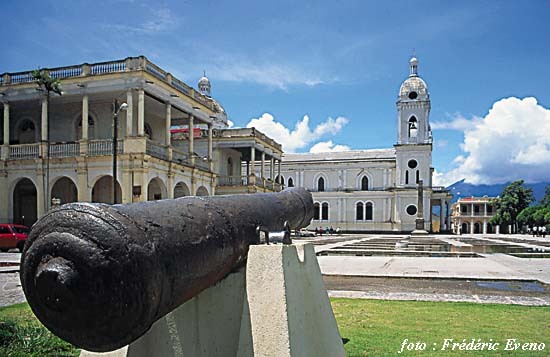 This was the first city founded by the Spanish on the Pacific side of Nicaragua. From its past it retains the colonial aspect which attracts so many tourists. 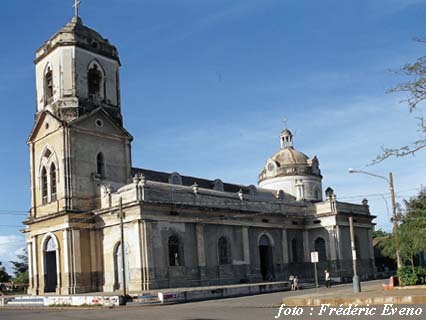 Additionally, Granada is a port from whence one may embark for Ometepe or for the San Juan River, crossing the great lake. Near the city are the Islets, if you’re looking for some recreation, and Mombacho Volcano if you want to trek through the tropical jungle. Take care not to get lost on the volcano; thirty years ago a group of fifteen college students were lost during a two week exploration of the Mombacho jungle. This grand colonial building was almost totally destroyed by the fire of William Walker in 1856. Only the stone doorway remained. Later it was rebuilt, keeping the original stone doorway. 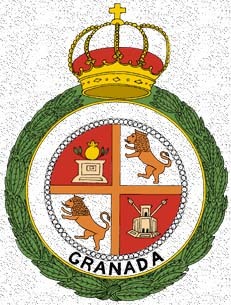 It was recently purchased and restored by the "Casa de Los Tres Mundos" (House of the Three Worlds), and later donated by this foundation to the citizens of Granada, on the condition that they maintain it as an international cultural center. 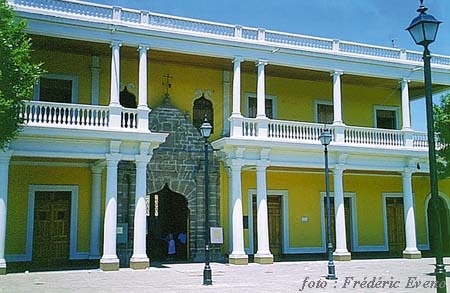 This convent was transformed into a museum, which presents an ample collection of prehispanic stone statues found on Zapatera Island (similar to the statues of Chontales). El parque de Granada .. .
. . . . . Masaya, City of the Flowers, is located 30 km from Managua. It is the most important center of crafts production in the country. 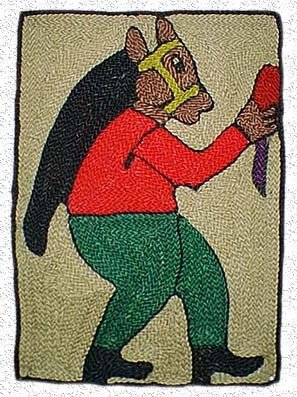 You can obtain craftswork at modest prices in the Market of Masaya. 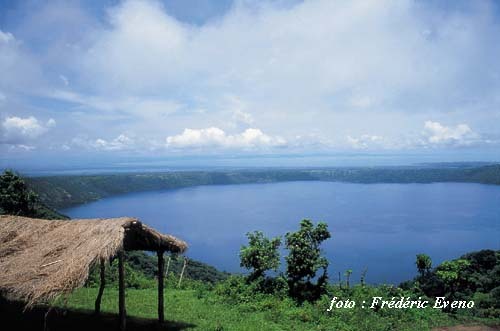 From the pier, you will have a wonderful view of the lagoon and the Masaya Volcano. 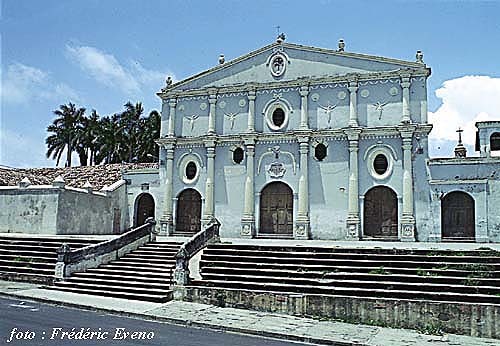 The city also has various colonial churches. 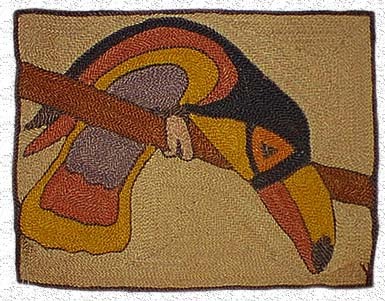 In Masaya you will find beautiful woven textiles with motifs inspired by Nicaraguan folklore. 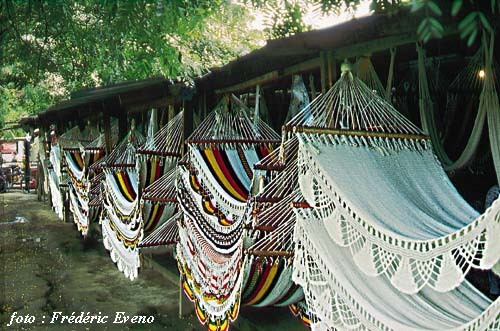 Without exception the most spectacular are the Masaya hammocks, famous throughout the world for their quality and beauty, and exported to many countries. 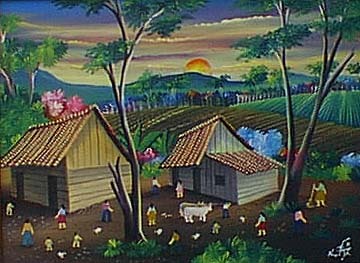 This rural region, known for its folklore, is near Masaya. It has an average elevation of 500 m, which gives it a cool climate ideal for coffee growing. In Nicaragua coffee is grown in the shade of gigantic trees, and accordingly, these are some of the most beautiful regions of Nicaragua. 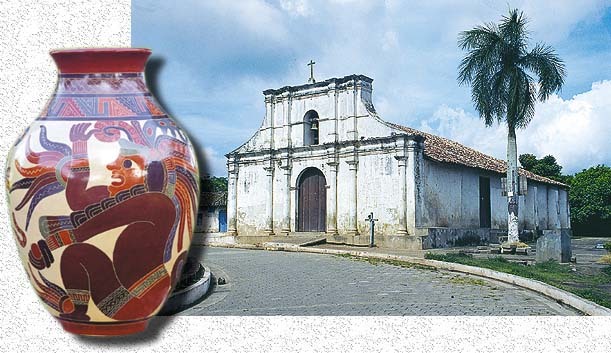 The town of San Juan de Oriente produces pretty ceramics with precolombian motifs.